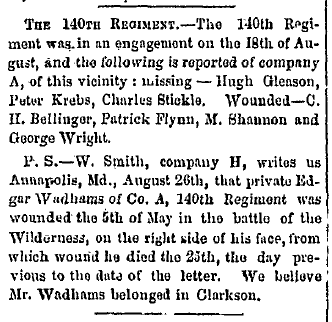 THE 140TH REGIMENT.—The 140th Regiment was in an engagement on the 18th of August, and the following is reported of company A, of this vicinity: missing—Hugh Gleason, Peter Krebs, Charles Stickle. Wounded—C. H. Bellinger, Patrick Flynn, M. Shannon and George Wright.